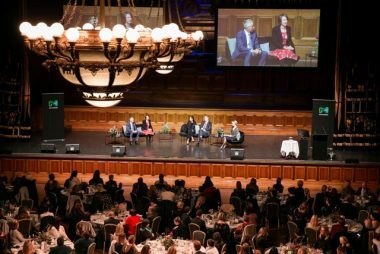 The guest feedback from the City of Melbourne Women in Business Lunch at the Town Hall has been overwhelmingly positive. As a community, we’re over the ‘talk’ and want practical strategies to help turn the dial towards diversity. The Champions of Change: strength and value from diversity panel included business leaders who are equality champions within their own sphere of influence. 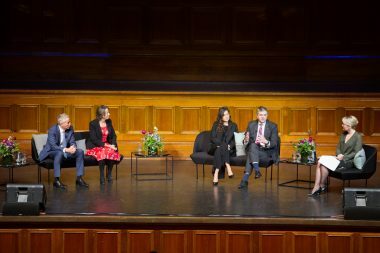 From left: Craig Tiley, CEO Tennis Australia, Jacinta Carboon, CEO Squareweave,Caitlin Isles, CEO Xchange, Ben Rimmer,CEO City of Melbourne & facilitator Martine Harte, Director Engaging Women. From the outset, the conversation cut through and was solution-focussed. We’re starting to see this real interest in investing in women, because it has been proven time and time again we use resources far more effectively. I know from Artesian’s portfolio, the three of the key standouts inside that portfolio – which is now the largest in Australia – are all female. I think the start-up ecosystem is a wonderful place for women and I encourage everyone in this room to come and play. Organisations that are more diverse perform better. If you reflect the community in your organisation you are better able to respond well to the pressures and needs that any given part of the community may feel at any given point in time. 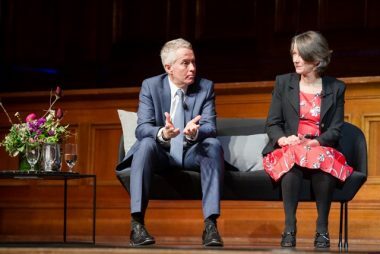 If Melbourne can be better at diversity and inclusion than some other unnamed cities – one or two come to mind – well then perhaps that’s actually a source of competitive advantage for us as a city as well. If you look forward the next twenty or thirty years, the knowledge economy, the tech start-ups, then really Melbourne is incredibly well-placed to take advantage of that growth in the knowledge economy and tech. And if we build on our diversity and inclusion strengths we’ll be enjoying it even better in that future. If you have gender equity in your business, your return on investment increases substantially. The more women you have on your boards, the more your sales increase, the more your return on investment increases. I really encourage everybody out there to make the most of that, because you’re missing out on those opportunities. Bringing diversity into your environment is good for everybody as it actually makes you think about things in a different way that you normally wouldn’t and that’s how we progress and that’s how we get better at what we do. CEO Tennis Australia, Craig Tiley. If everybody in the organisation knows that any role they have, no matter who they are, is completely flexible and if they need to take long periods of time off for childcare, long periods of time for whatever, we’ll accommodate and we’ll support that. Because it’s my belief that the productivity that you get out of that outcome is far greater than any cost of having someone away from their job. Sometimes in small companies, it’s hard to do but it always comes down to a cost issue, go and do the calculation and it works out on the positive. Craig Tiley. As a leader you can’t micromanage every part of the organisation. You can’t control everything so it’s important also to set the right framing and the right principles around the place so that people know what’s expected. To take one very important example, the State governments target for women on boards has had a transformative effect and very practical effect, if you think about the long sweep of history on this topic. In a space of a couple of years it’s gone from 33% to much closer to 50% in a space of a few years, what a great initiative. And it couldn’t have been done without some type of target arrangement so there’s lots to be done in that area. Ben Rimmer. For a year and a half we’ve had an all roles flex arrangement here in the city and it has challenges, it has moments and there are many other organisations that are doing this. For women in the organisation there’s been something like a 50% increase of the number of women taking some form of work flexibility since the introduction of this new policy. But for the men there’s been a 100% improvement, it’s actually doubled, admittedly from a lower base, but really what I take out of that is it has given permission for men in the organisation to actually stand up for what they know is right and play a more flexible and equal role in their private lives and I think that’s something the organisation can be really proud of. Ben Rimmer. We all know you can read job ads and the job ads are written primarily for men. But if you don’t go out and search and you don’t go out and actually have a program in place where you are recruiting, you’re not going to find women for those roles. So we’ve installed a program where we are doing that and therefore the change in recruitment, therefore the change in diversity and the change in culture is shifting very quickly. So it’s only hard to do if you don’t make an actual plan about doing it, it’s not that hard to do. It’s interesting, I still find it difficult when we’re talking about things which should be normal, it’s beholden on us to find a way to some of those action plans, there’s plenty of creative techniques to get through. Craig Tiley. In the city we’ve just moved towards a gender neutral parental leave arrangement which emphasises the fact that all partners in that parenting relationship should play an equal role in parenting and has a kind of use it or lose it flavour. We now offer 20 weeks paid leave to supporting parents, if they are going to support their partner return to work but only if you do it within the first eighteen months, which is a little bit nasty by design. Most companies have this rule that says you actually have to be at a workplace for 12 months before you can access parental leave, it’s actually written in to many awards and you have to commit back at a work place after returning for twelve months before you can access it again and it is deeply, deeply unfair. When you actually stop and think about it, what it says to women in their thirties primarily (and increasingly hopefully men in their thirties) if gender leave neutral parental leave works, is that you can’t be mobile, you can’t get a new job, you can’t change employers if there’s a chance you might be about to get pregnant. And we all know that life isn’t particularly predictable right? So this is a really big issue and it’s so simple to change. We’ve just changed it in here, and we changed it because the women in the organisation told us through a program that we run that it mattered to them. Most organisations have actually never thought about this rule it’s always been baked into the system and we can just change, just get rid of it overnight. Ben Rimmer. A sponsor is somebody who can advocate on your behalf when you’re not there and that is something you really have to work on. You really have to engage with people for them to be your sponsors. They need to understand your strengths, and the only way you can do that is through a trusted relationship, not through a paid relationship. Jacinta Carboon. From a board perspective unfortunately the statistics are very low, especially the S&P 500 companies, it’s less than 4%, in the tech sector it’s actually dropping back even further and there’s one insight around this whole topic that I think is really important. So ensuring events like today and every other forum, ensuring there is equal balance. The second is exposure to experience and knowledge this is exceptionally important from a board perspective, that women who are sitting on boards ASX and private make themselves available and give a hand up and support, mentor and encourage other young women to go out and do their ARCD. Come and sit in the board room and understand what it can be like. It’s equally important for women in this room to put their hand up and find other women who are on boards and learning from them now because the ascension to a board is a long journey, it’s not very quick so please find yourselves a mentor who can help you on that journey. Somebody that can support your career, and somebody who is actually charged with the responsibility to bring metrical results and i think that’s how we’re going to start to get more women on to boards. Caitlin Isles. Have a very clear target and hold yourself to account on that target. If you haven’t got it, get it and put a timeline on it. Form a women in leadership point of view and from a board pint of view, as an organisation Tennis Aust has been able to do it so I think anyone can. Craig Tiley. I think it’s really positive that we now have a frame for men in stepping up beside women who have been fighting this fight for a long time and really working on fixing the system and not trying to ‘fix’ women. Really what it means for men is speaking up when we see stuff which is out of line, it’s amazing when you start looking through that lens how often something on Facebook, or Linkedin or an event and it’s just not ok.
And I’m not talking about the really obvious kind of sexual harassment and those kinds of things but the really subversive stuff like prized winning architects there’s five on stage and they’e all men. And I’m actually going to speak up about it and say it’s not ok. Ben Rimmer. It’s about recognising the achievements of the women who are on their way up. Help them achieve an industry profile, use your own communications departments and hold networking events. It’s hard to believe that in 2017 we are not seeing women nominated for major Australian awards. 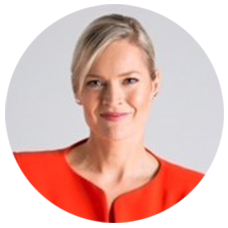 I encourage everyone to check out The Women’s Agenda Leadership Awards, Australia Day Honours, Australian of the Year, Telstra Business Woman of the Year, Victorian Honour Roll for Women and the Australian Small Business Champion awards. Martine Harte. The candour from panellists in telling their own personal stories was inspiring. 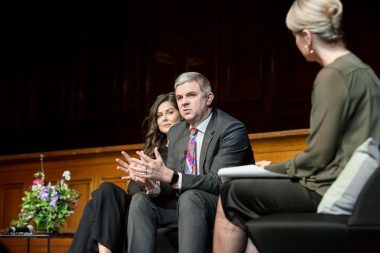 Acting Lord Mayor Aaron Wood paid tribute to Victorian Government Minister Fiona Richardson, honouring her tireless dedication to women’s rights and activism against family violence. The State government was represented by Ms Richardson’s colleague and friend, Natalie Hutchins, who wore suffragette purple in her honour. The official charity partner for the event was FightMND’s Dr Melissa Yang. We look forward to bringing you more about Melissa’s good work in coming weeks. And lastly, big thanks to Natasha and the events team for a seamless show! Find out how to hold your own event here. Posted in Career insights, Engaging Voices, General. Tagged in Diversity, Male Champions of Change.